Twilight has a lot to answer for. Boys now all want to be vampires - dark, mysterious and irresistible to girls . . . well maybe not the last one! 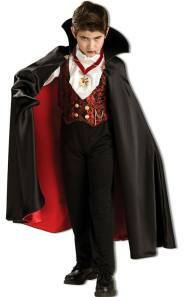 This Transylvanian Vampire Fancy Dress Costume For Boys is a cut above the rest and will transform any little boy into a super cool Little Vampire. Ideal for Halloween and for film theme parties, the outfit includes a long black and red cape with a stand-up collar, a red and black patterned waistcoat with an integrated white shirt, a pair of black trousers and a medallion. This outfit is available in three sizes - small (age 3-4), medium (age 5-6) and large (7-8 years) and costs £22.99 online.